Forget uncomfortable chairs and stale popcorn, these luxury cinemas make watching a film a truly enjoyable experience. From hot food brought to your table to cosy sofas that you'll want to take home, read on to discover what the best luxury cinemas in London have to offer. This dinky Islington cinema has a stunning facade, sofas and waiter service. An elegant art-house cinema in the heart of Mayfair. The original Curzon Cinema, this swish venue is one of London's most attractive cinemas and has a long pedigree of showing art-house films. Housed in a Grade II-listed building, the Curzon Mayfair has one of the largest screens in London, two luxurious Royal Boxes, a fabulous bar and a second, more intimate screen. This cinema was one of the first to import and show foreign language films in the UK, and is believed to have caused the introduction of the X-certificate to the UK as a result of the Max Ophuls' screen adaptation of Arthur Schnitzler's controversial late 19th-century play, 'La Ronde'. The same high standards can be found at all the other London branches, located in Soho, Chelsea, Bloomsbury and Richmond. A chilled-out vibe combined with sofas and snacks served at your seat. Lush leather armchairs, beds on the front row, comfy footstools, wine coolers and small tables storing snacks and drinks make this small, independent cinema one of the most appealing in London. Nestled in the middle of Notting Hill's ultra-trendy Portobello Road, the Electric offers a unique cinematic experience and is hugely popular with people from the film industry and average film-fans alike. With a programme that mixes current blockbusters and quality mainstream movies with classics and art-house films, the cinema's programme reflects this new concept. London's oldest cinema (it was opened in 1910), the finely restored Grade II-listed building boasts a gorgeous gilt-domed box office with a pretty mosaic floor leading to an elegant panelled auditorium in Baroque style. Start the evening off with tapas-style snacks such as delicious olives and freshly prepared Mediterranean nibbles or order fish and chips and scoff wholeheartedly during the programme. Stock up with a bottle of wine, recline in a plush leather armchair, place your feet on the comfy footstools and enjoy the comfort of your own home with booming surround sound. There's a great bistro-style restaurant and bar attached too - a destination in its own right. Posh, art-house Hampstead Village cinema with sofas, foot rests and waiter service. Bang in the middle of Hampstead Village, the original Everyman Cinema is just one of a few London branches, with others in Maida Vale, Belsize Park, Baker Street and Canary Wharf. With sofas, armchairs, wine coolers, waiter service and a well-stocked bar, as well as the option of booking your very own private club suite, the Everyman chain boasts recommendations from celebrities as diverse as Ewan McGregor, Jools Oliver, Gianluca Vialli and Giles Coren. If the Prince Charles Cinema is the equivalent of a wonderfully cheap gastropub, then the Everyman is a Michelin-starred establishment. If the Queen has a home cinema, it's probably like this. The perfect film buff's cinema, the BFI provides the luxury of a generous programme and regular film festivals. Originally the National Film Theatre, the BFI Southbank is the perfect film buff's cinema, with three large screens and a smaller studio space showing up to 2000 films a year ranging from classics to independent movies as well as gala openings. It's also the heart of London's many film festivals, and the place to go to see obscure arts films, classics, and seasons of works by great directors. Each year the it hosts The BFI London Film Festival as well as the annual Gay and Lesbian Film Festival. The on-site Mediatheque also gives visitors and film-lovers the chance to access hundreds of films and TV titles from the BFI National Archive, absolutely free. Beyond the films, the BFI Southbank also houses a gallery space which showcases works by leading UK and international artists, and there are two bars and a cafe. These immersive productions are one of the best ways to experience cinema in London. Known for their immersive cinema experiences, Future/Secret Cinema provide one of the best ways to experience cinema-going in London. Each event sees the team transform a London venue into a film set and bring it to life through costumes, food and theatre performances. Previous events have included Shawshank Redemption, which asked guests to sport prison costumes, eat prison food and witness a brawl before settling down to watch the film; Casablanca, which transformed The Troxy into Café Americain; and Saturday Night Fever, which brought back disco balls, flares and dance-offs for the sexiest disco night since Studio 54.So, if you want more than just popcorn and an oversized drink when visiting the cinema, keep an eye out on their future productions - tickets always sell out fast. The historic Regent Street Cinema is where the first ever performance of moving images took place. 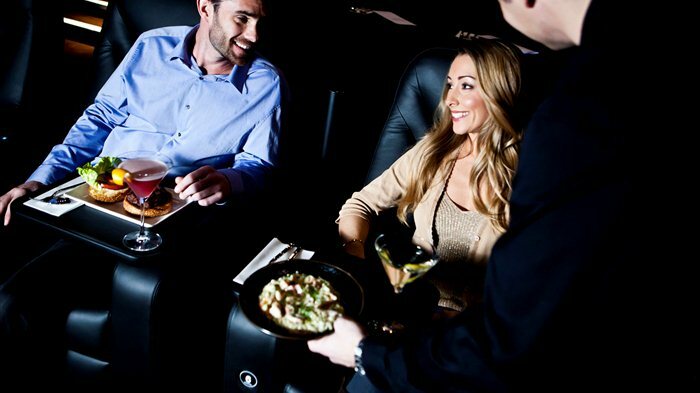 Leather armchairs, cashmere blankets and booze all add up to a luxurious cinema experience. Previously the Aubin, the Electric Cinema in Shoreditch is housed within the three-story Barber & Parlour, which combines a barber, bar and coffee station, and the cinema. Part of the Soho House group and sister to the original Electric Cinema in Portobello, the cinema is unsurprisingly luxurious, with leather armchairs and footstalls, tables to rest your drinks and even cashmere blankets to snuggle under. 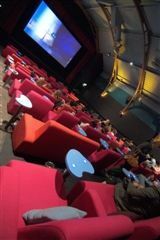 The 50-seat cinema also serves a gourmet menu of snacks, including mini honey and mustard sausages, Quibble nuts, Portlebay popcorn, a black pudding sausage roll and hummus with pitta. Was it down with a glass of bubbly or wine, a pint of beer or a cocktail. From cheap budget hotels to luxury 5 star hotels see our discounts for hotels, including DoubleTree by Hilton London - West End from 38% off.